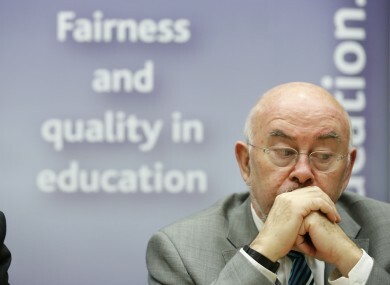 A GROUP OF Catholic priests have said Ruairí Quinn’s suggestion that schools could use religious teaching time for core subjects is an effort to undermine religion. The Association of Catholic Priests strongly criticised the Minister for Education’s suggestion after he said that religious teaching should take place within homes and parishes, rather than being the responsibility of schools. The group of socially progressive priests questioned whether the Labour minister was trying to remove religion from the public sphere and said his comments were not reassuring for the ‘large numbers’ of Catholic parents who wanted their children to receive religious education in schools. “It seems at best a hapless effort to devise education policy ‘on the hoof’ and, at worst, an indication of an intention to undermine religious education in the vast majority of our schools,” the ACP said. “The Minister’s comment will be widely interpreted as an effort to undermine religion and religious-run schools and may damage the negotiations, at present at an advanced state, to provide a wide choice for parents”. “The Minister may be unhappy with the pace of change, and with the power of parents to influence decision, but his unreflective comments could have the effect of placing a huge question mark over the Minister’s intentions,” the group said. The ACP said that opinions “which will be interpreted as threats fail to reassure those in discussion with the Minister, or the large numbers of Catholic parents who have a right to the religious education of their children”. Email “Priests tell Ruairí Quinn to stop undermining religion in schools”. Feedback on “Priests tell Ruairí Quinn to stop undermining religion in schools”.